flects the character of your event or club and can raise funds to make them thrive! Avoid solid coverage areas larger than a thumbnail. Large solid areas do not stamp well because air gets trapped and causes unwanted drop outs. Outlining can help in most cases. Areas of detail that are too small may bridge (fill in). Particularly when a very fine line is created between two dark areas. Very fine lines in conjunction with solid areas can produce “cut-through” from uneven distribution of stamping pressure. Text sizes should be 12 points or higher to avoid letters and counters bridging. Select fonts that are well spaced within each character. While these examples are the same size in points, the second example will fill in. Whenever possible, leave space in the center of your design. The sprue on the underside of the disc can vary in size from disc to disc. This variance can cause unsightly drop outs. We’ve got a ton of stuff in our downloads section. 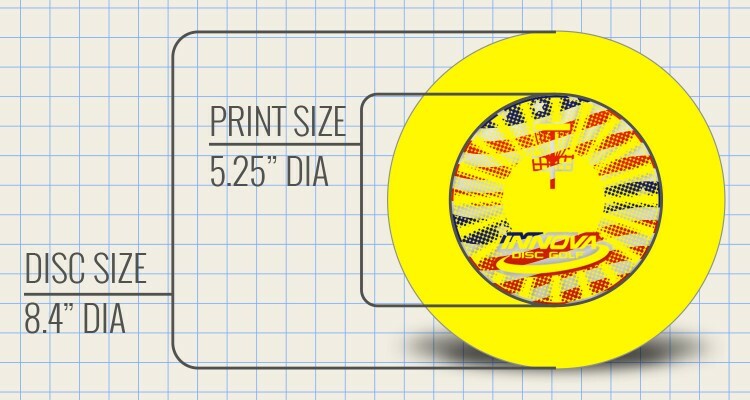 Need some DISCatchers in your disc art? Looking for a nice disc flying into a basket? Well look no further. Check out the Disc Art Elements in our downloads section, and get started with your custom order today! We can make changes to your files in most cases. Any lengthy changes may be subject to prorated design fees. Additional in-house artwork design is billed at $45.00 per hour. A quote will be issued before any charges are applied. Graphics which are determined to be flagrantly violent, vulgar, or offensive will not be reproduced. Innova retains sole discretion to make a determination in this regard.